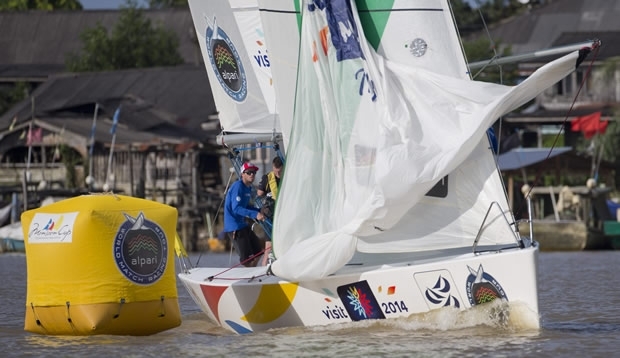 Teams from France and the US Virgin Islands made the most of their first day on the water at the Monsoon Cup in Malaysia today. Competing in light winds on a sunny day in Kuala Terengganu, last year’s winner of the Monsoon Cup, Taylor Canfield and USone, justified their billing as favourites, with three straight wins. Pierre-Antoine Morvan’s Vannes Agglo Sailing Team haven’t had such an impressive season on the Alpari World Match Racing Tour, but matched Canfield’s hat trick with three wins of their own. The final match of the day for Morvan produced some nailbiting moments as the French looked to have conceded an easy win over Phil Robertson when they dipped too early for the finish line. As the French spinnaker collapsed, the Kiwis on WAKA Racing came tantalising close to snatching victory from Morvan. But the French held on. Canfield’s most important win came in his first match against the other Kiwi skipper at the event, Adam Minoprio and Team Alpari FX. Minoprio and Robertson will both be disappointed to have come away with just one win from their three matches today, although even that is preferable to zero victories for Team Gilmour from Australia and local sailor Jeremy Koo. The young Australian team suffered a major setback with skipper David Gilmour taken ill earlier today and laid up in hospital, leaving bowman Pete Nicholas to move to the back and steer the boat. The stand-in skipper had his moments, leading two matches, but was unable to maintain those leads to the finish. As a sign of just how seriously Malaysia is taking this event and the sport of sailing generally, the opening ceremony of the Monsoon Cup attracted royalty and national politicians. Representing the Sultan of Terengganu was his brother, YAM Tengku Sri Temenggong Raja Dato’ Seri Tengku Baharuddin Ibni Al Marhum Sultan Mahmud Al Muktafi Billah Shah, who officially opened the Monsoon Cup and welcomed the 12 teams from around the world. Also in attendance was the Minister for Youth and Sport, YB En Khairy Jamaluddin, who later took part in the ProAm racing and won the series of three short fleet races, crewed by reigning World Champion Ian Williams. The four-time Tour winner didn’t get to match race today, but Williams used the three fleet races to get a gauge on the tricky currents and wind shifts on the race area, known as the Palau Duyong. On hearing this observation of his alleged tendency to be in the trailing position, Minoprio countered: “I don't know where that information comes from, probably just a biased opinion from Ian,” he correctly surmised. “In reality who knows who leads more around the top mark? Some years it's been me, some year's it's been Ian.” Today Minoprio found himself in the trailing position more than he would have liked, although it’s early days. And while some of the leading lights like Williams have yet to race, the mind games have certainly begun.